Finding widest portion of river bank using ArcGIS Desktop? I am having a long portion of river. Here I am displaying part of it. In this polygon which is transparent black. How do I find the wider track (bank to bank perpendicular from the center line) using ArcGIS Desktop? Computing polygon skeleton and perpendiculars to segments are very challenging tasks. Measuring from "bank to bank" is too vague. In the image below I've illustrated 8 different ways you can measure to the south bank from a single point on the north bank (red arrow). We need to be more precise about how the measurements should be taken. If, as JR suggested, you measure perpendicular to the river centerline, you need to obtain a river centerline. In the example below, I drew a hypothetical river centerline. As you can see, at any given point along the river, there's only one line that stretches from bank to bank AND perpendicular to the river centerline. So this is a better way to measure bank width. Pick a single software package. Asking for answers in more than one software package (ArcGIS and QGIS) makes a question too broad for this site. See Asking good Questions for GIS Stack Exchange? for more information. If you need help figuring out how to use your chosen software to measure from bank to bank and perpendicular to the centerline, edit this question or ask a new one. v.centerline creates a new map with a line representing an approximation of the central tendency of a series of input lines that all have similar trajectories. This can for example, be the central line of a river represented by its two sides, or a line representing the general direction of a series of flight paths, etc. Once you have the centreline, you can use v.transects to create perpendicular lines at a very small interval, and then clip them to the boundaries of the source polygon. 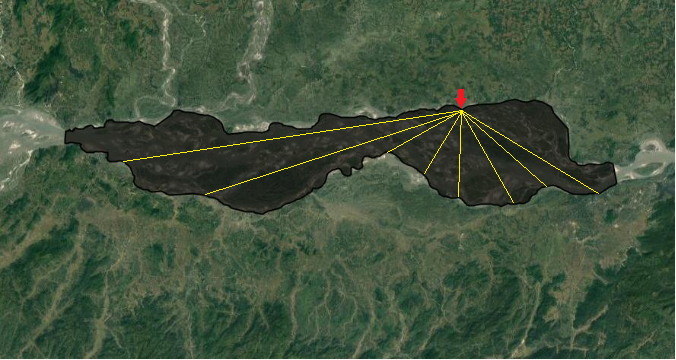 I have also seen ST_ApproximateMedialAxis() in PostGIS used to derive river centrelines. From there you can use the same method as mentioned earlier with v.transects() to find the "widest portion"
As others have already pointed out, however, it is a very difficult question to answer objectively, but I think one of these methods will get you a reasonable and reproducible answer. Not the answer you're looking for? Browse other questions tagged arcgis-desktop arcmap or ask your own question. Checking if polygon fits inside another polygon using ArcGIS Desktop? Finding minimum edge to edge distance of polygons using ArcGIS Desktop? Finding long axis of irregular polygon using ArcGIS Desktop? Generate straight lines between river confluences using ArcGIS Desktop? 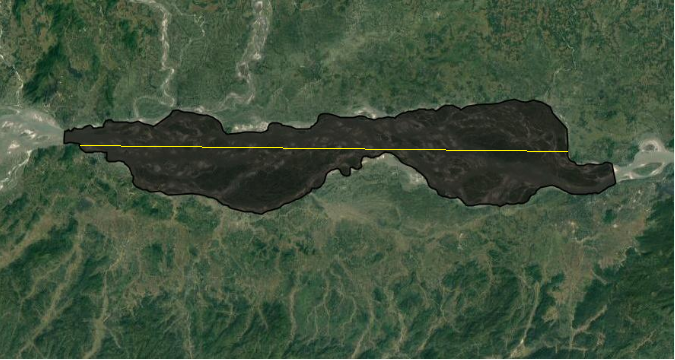 Estimating river Channel Width using Python/ArcGIS/MATLAB/R? Calculating Polygon Width at Increments using ArcGIS for Desktop? Convert polygon to line using ArcGIS Desktop? 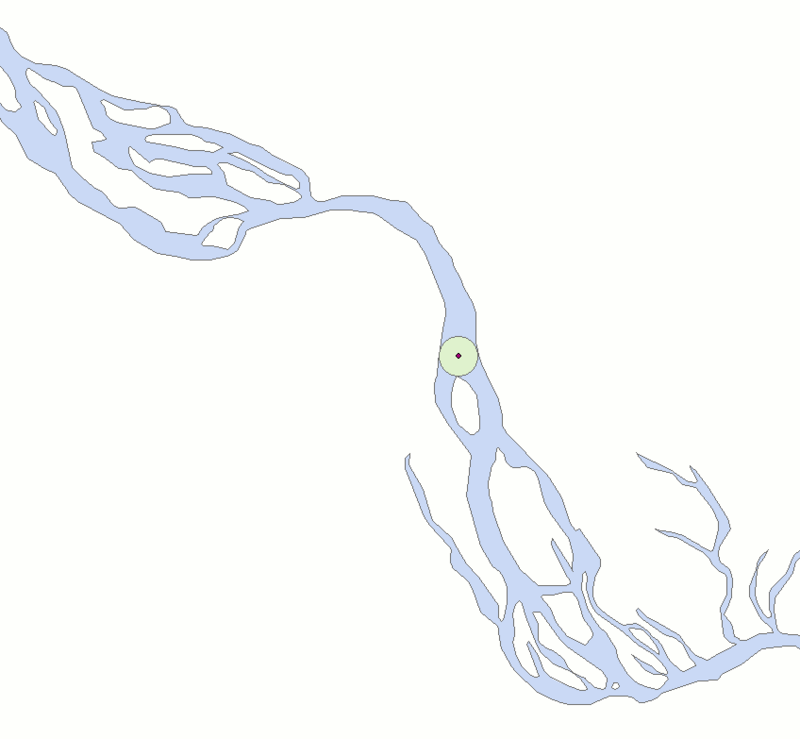 Finding distance from river outlet to points, following river, using ArcGIS Desktop? Calculating Distance from Outlet to Dam(s) using ArcGIS Desktop?